I just started reading the Jack Reacher series – by Lee Child. I found this difficult, as Tom Cruise plays Reacher in the movies. It’s not like we use to be best buddies, Tom and I. It’s ever since I watched Top Gun, and his character was such an arrogant… All I needed to love that movie would have been for some Russian to blow him out of the air. No such luck. I’ve hated him ever since. The Good: There is an awesome new introduction by the author in the book I got – the book has a great story line, lots of fun to read, not too steamy. Too much steam, I reach for another book. I’m married. I don’t need to read about what make-believe people are doing between the sheets. I love the way Lee Child has Reacher fix things as he goes, instead of doing stupid things throughout to increase the tension. There were plenty of other characters to do stupid things. 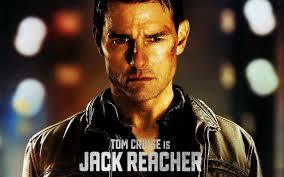 The Ugly: Did I mention that Tom Cruise plays Reacher in the movie series? shrimp with 12 retina – evolution or design?